The chances are that you have a router with a USB port, just like I have my TP-LINK TL-MR3420 router. It is likely that with more intense usage of your router, you will need more disk space. This can be achieved by connecting any USB storage device into the USB port of the router, such as pendrive, external HDD, memory card reader, cell phone, etc.. 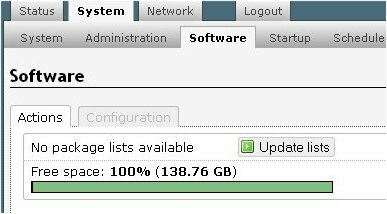 Unlike a Linux Desktop, OpenWRT is starved of disk space in the extreme. One way to overcome limitations and gain some “Mega” space is to remove installed kernel modules. This may not be at all very convenient, In general, for router with USB port, OpenWRT includes kmod-usb2, a pre-installed basic module support for USB, which can be expanded to allow for external storage. – TP-LINK TL-MR3420 Router* with OpenWRT Linux distribution for embedded devices and stable release of Attitude Adjustment. ** In my case, I have an old 2,5″ 150GB SATA HD (bought long ago, I don´t remember how much probably 75,00€) that I decided to put into an external BlueRay USB box (cost 13,99€). Our SATA HDD needs to be partitioned and formatted to be recognised by OpenWRT. We use MiniTool Partition Wizard Home Edition. Besides being free it is easy to use. Hook up your SATA HDD to your PC. Partition 1 with 1GB for LinuxSwap and Partition 2 for Ext4 with remainder space of our SATA HDD. Make sure you have Internet connection. 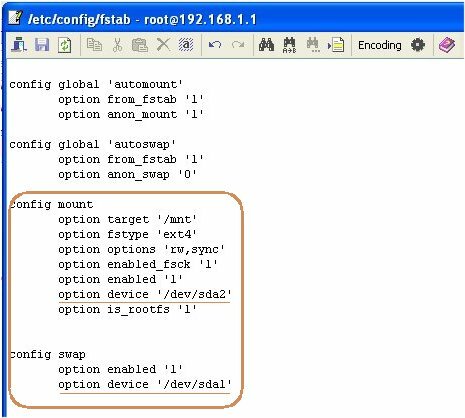 In my case I have my router with static IP address 192.168.1.1 with main gateway pointing to address 192.168.1.254 belonging to my ADSL router THOMSON TG585i V.7, with Internet and custom DNS server pointing to Google´s Open DNS address 8.8.4.4. 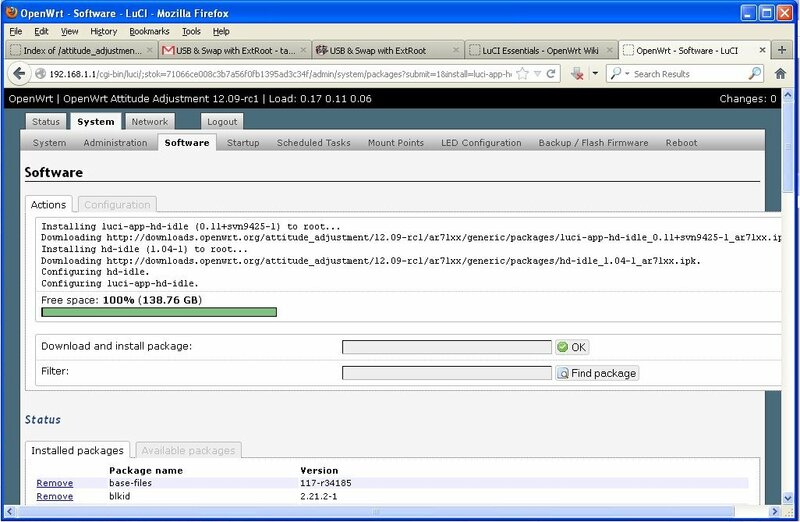 STEP 2: We next install kmod-ub-storage packages. In Filter field write kmod-usb-storage and click onto Find package. The result will be shown below as shown. We will install kmod-fs-ext4 package by clicking Install link on the left of found package. Again a popup window will ask us if we want to install kmod-fs-ext4 package and we will click OK button. Results of installations of packages will be shown as previously. 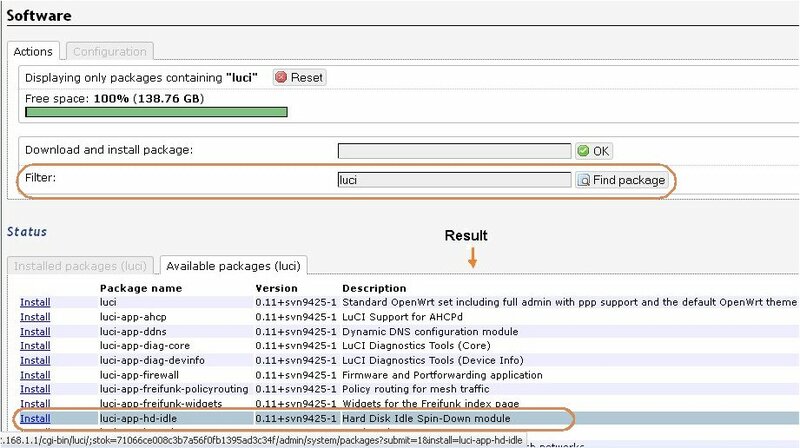 We will install block-mount package by clicking Install link on the left of found package. Again a popup window will ask us if we want to install block-mount package and we will click OK button. Results of installations of packages will be shown as previously. It is interesting to note that all installations have reduced the available in my case to 38%. After rebooting go to System -> Software tab and Voila! A while ago we saw we had 38% of memory now we have 100% and much more memory! Note that there are no package lists. We will do something about this later. We also note that mount point /overlay is correctly mounted in /dev/sda2. STEP 10: It seems all is fine. Now we will update the package lists like in STEP 1 and do something final about spin of HDD. We have concluded our task of USB, HDD, Rootfs and Swap. By installing hd-idle we have proved that the HDD has substituted the internal limited memory of our router. A special thank you is due to K. L. Seet for excellent tutorial found at that website. Most of this post is based on that tutorial. 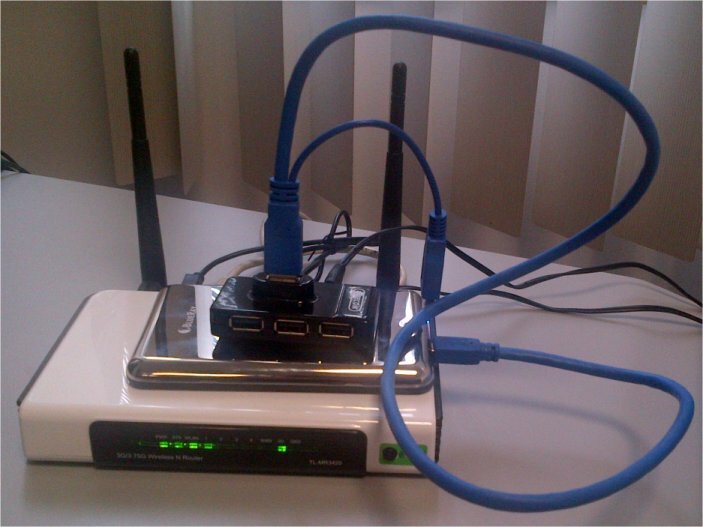 This entry was posted in Electronic Projects, Information Technolody and tagged ExtRoot, LuCI, OpenWRT, Rootfs, Router, Swap, TL-MR3420, TP-LINK, USB Storage. Bookmark the permalink. Welcome to my blog. Shukran for the praise. Welcome to my blog. I am algad the information has been useful to you. You have to mount the partition, are you sure it is sda2? If you have only one partition it will be on sda1. 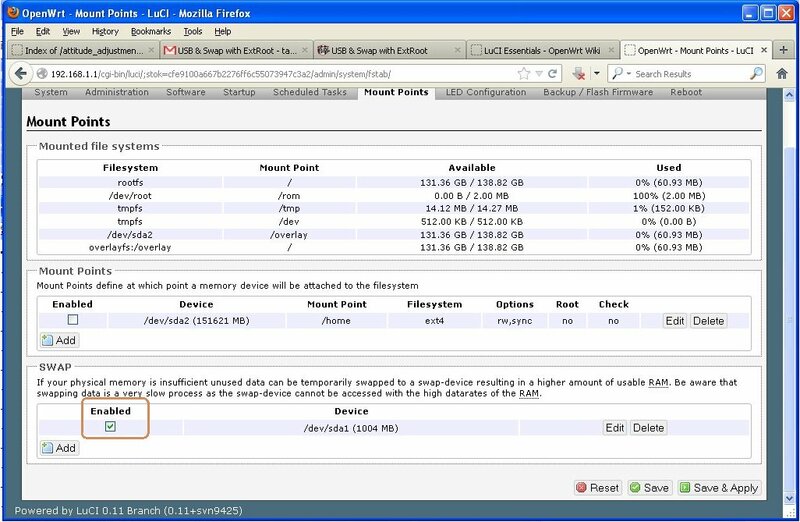 On dmesg you should see that the partition is detected and what is its name. After completely installed OpenWrt on TP-LINK TL-MR3420 router, then I installed all of the necessary USB storage package to the machine. But I still couldn’t mount any USB storage. Any idea ? It didn’t trigger any errors or warnings. 4) /mnt still haven’t mounted. what speed you reached via wifi, when you copy data from external drive to computer? Welcome to my blog. I did not test. My objectives were to make the system work and have in fact concentrated in other projects and did not come back to this one. If you find out any feedback here will be appreciated. I made it. I used Tp-Link Mr-3420 v2 (faster processor) & 1TB external drive. Copying data via FTP reach 2MB/s. Damn, I was hoping it would be faster. The same I had on LevelOne Wap-0008, but maybe Tp-Link will be more stable. Welcome back again Krzysiek. Excellent. Are you going to write an article? If yes, please share the link here. Have you investigated the reasons of the data rate you get? There are many constraints I guess: USB data transfer, External drive speed and perhaps even the processor in your modem. You can find the reasons from datasheets. Hello Mario. Welcome to my blog. I am getting into VPN but not much yet. I am thinking in VPN mainly due to encrypting and privacy. If I learn something I will share. Also do the same and let us know here. Welcome Pavel to my blog. There are some NFS projects that you may adapt. I’ve never thought of this approach. If you do googling “nfs site:openwrt.org”, you will find relevant information. Do share here information if you find a solution or write with intention of sharing your findings. Welcome to my blog. Sorry for the delay in replying. Did you sort out the problem? Welcome to the blog. Sorry for the delay in replying. It seems a dependencies problem not easy to deciphrate. Perhaps a re-installation may help. I have done everything, I can mount the NW share, I can log to the NW share, but Im not able to copy large file (even the HDD has about 580GB). Could you please advise? Welcome to my blog. I suggest you post this question in OpenWRT forum (the appropriate sub-forum). Thank you, I’m using my 16GB USB as network disk on SX763 OpenWrt. Your guide is well written and easy to follow. Welcome to my blog. I hope the tutorial was useful. Do you want to share your project? Your tutorial is very detailed with pictures and explanations and thank you once more. I shared it on our OpenWrt thread. Keep up the good work! Cheers! Thank you for sharing information and your kind words on my tutorial. All the best for you! Welcome to my blog, Not really no ideas, without knowing what you are doing. Hi, I following the instruction, but after reboot I don’t see the mount points that you have in the pics that you showed. It looks like my router is reseting everything on startup, i.e. recreating all the links and it is loosing links that we setup. Can you please help ? excellent guide! I followed all your instructions (main difference was that I used a 32GB pen drive), but it seems I can’t get swap working at all, no matter what I try. Main partition is Linux ext3, /dev/sda1, correctly mounted; swap is on logical /dev/sda5, but swapon -a ends with: “block: failed to swapon /dev/sda5”. Every single time! Did you sort out the problem? Sorry for the belated reply. Will this survive a firmware update? Probably if the upgrade is for same firmware you are impplenting. 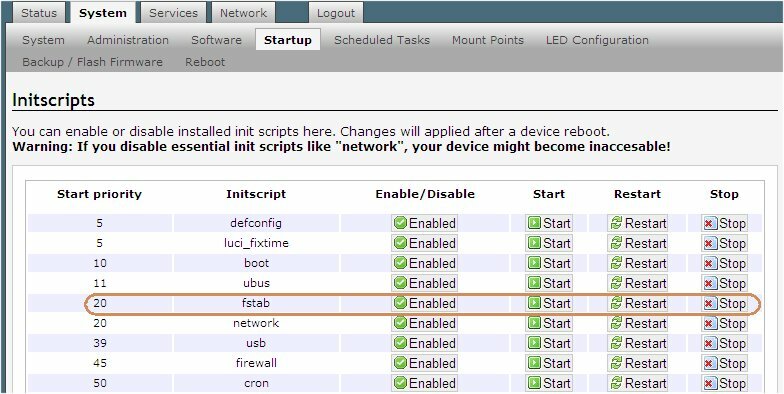 Is it possible to use this method for tplink mr3420 v2? Sorry for late reply. I think so. Great tutorial ! although I had to make my own firmware preloaded with necessary packages. Are you going you to share what you did? Hi, I have a question? 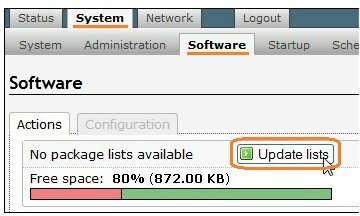 opkg update & opkg install kmod-rtl8187, is it enough to install alfa driver on the new storage that you made? Welcome Mohamed. I am not sure. You can always try and see what happens making sure you have an update that works with your router. 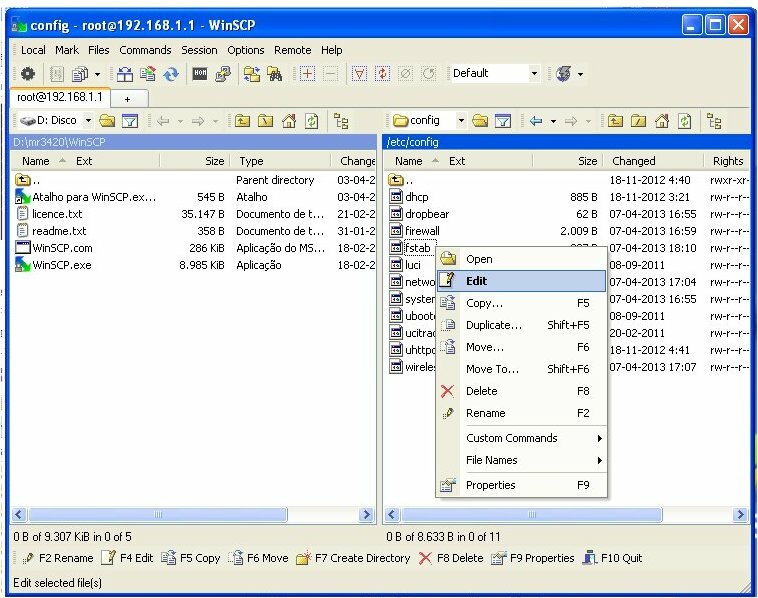 do you use ext3 or ext4 for the disk?